It’s called the Falling Sand Game. It may not make much sense at first, but you’ll soon find yourself dazed and amazed by the falling sand pellets! You simply play with elements like plants, water, fire and others, and see how they interact on the sand that is continually falling. Every once in awhile, a little guy comes out and bounces around, reacting to the elements. Try to find things that will make him act differently. 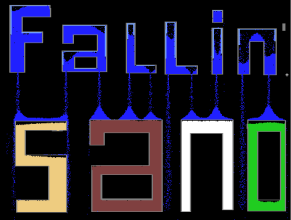 UPDATE: Here’s another version called Falling Sands game.